Vintage Cellars recently completed a wine cellar installation project in Pacific Palisades in Los Angeles. They had to create a residential wine cellar design that would fit the client’s budget and limited space. They used Vintage View metal wine racks to create a sleek appeal. They wanted to display the bottles like they are floating in the air, so they used the floor to ceiling frames to mount the wine racks. Find out more about this project. Wine suits the laid back lifestyle in Los Angeles, California, and offers a unique kind of pleasure that no other beverage can. It is usually seen on a dinner table at home, in restaurants, and hotels. Typically, homeowners who do not have a climate-controlled wine room store their wine collection in cardboard boxes, kitchen cabinets, or on shelves in their living area. 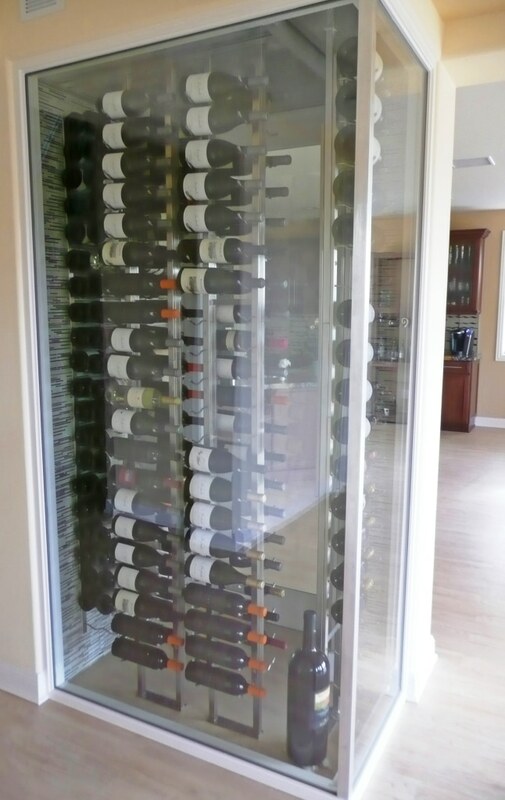 Lack of knowledge about proper wine storage can result in a waste of investment. 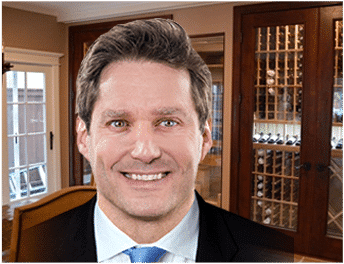 At Vintage Cellars, one of the top-notch builders in California, they recommend investing in a wine room that is designed to create the perfect storage environment for your collection. In Los Angeles, Palisades, an owner of a modern home wanted to transform a small space into a wine cellar that would suit their love for contemporary design. The primary goal was to stay within the owner’s budget and maximize the storage capacity of the small space. Air leakage from a wine cellar can be detrimental to wine. It can alter wine’s quality and may result in unpleasant taste and aroma. At Vintage Cellars, they always see to it that the walls and ceiling are properly sealed before the installation of the wine racks, cooling system, door, and flooring. They also added insulation and sealing components to the entryway. In addition to preserving the desirable characteristics of wine, sealing the wine cellar can increase the lifespan of the cooling system and reduce energy consumption. When warm air enters the wine room, it forces the refrigeration unit to work excessively, resulting in higher electric bills. It can also cause breakdowns and significant expense for the repair. Building a wine cellar without insulating is like a leap in the dark. Proper insulation of the walls and ceiling will prevent the cold air from escaping the cellar and the warm air from entering the room. Without it, there will be moisture build up. When this happens, molds and mildew can grow on the racking, corks, and other areas in your wine cellar, which will put your investment in danger. In this installation project, Vintage Cellars used closed cell polyurethane spray foam. This type of insulation has a dual-purpose: it acts as an insulator and a vapor barrier. With a compact cell structure, the closed cell spray foam expands to prevent unwanted air from leaking into the home wine cellar. Additionally, this spray foam cannot be easily damaged when exposed to water because it is water resistant. The wine cellar door must also be constructed and installed by a professional to create an airtight seal. 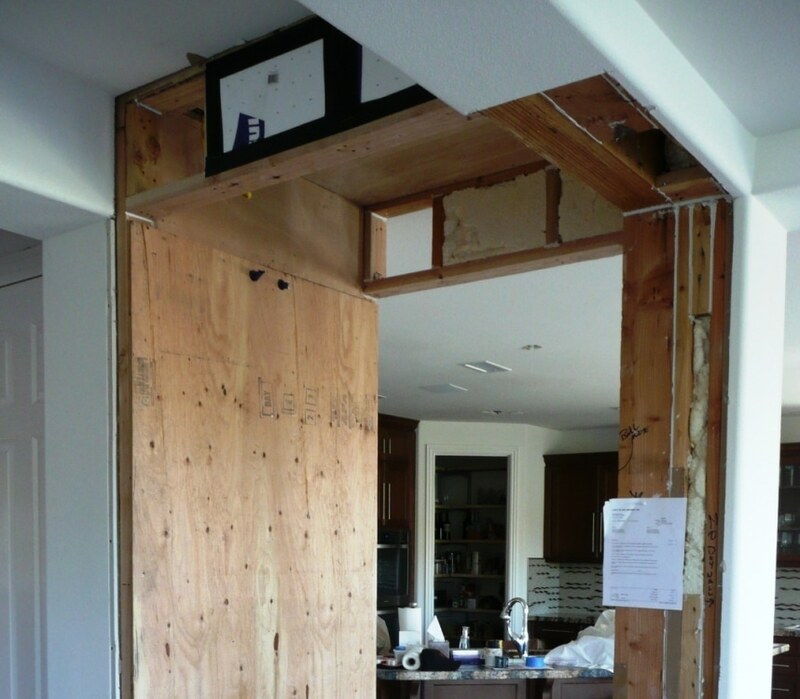 Vintage Cellars used an exterior grade door to allow it to withstand the humid conditions. The door is a dual pane glass style and insulated. It also has weather stripping, which also plays a significant role in preventing moisture build up in the room. The goal was to create a modern storage area for the client’s wine collection without going over the budget. Vintage Cellars used metal wine racks manufactured by Vintage View. 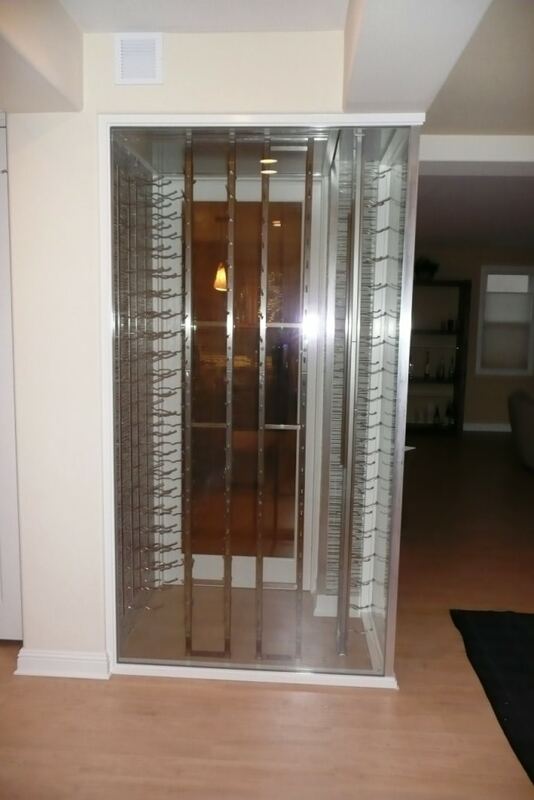 Unlike wooden wine racks, metal racking can fit even in the tiny nook of your wine cellar. This type of racking system was a smart choice because it maximized the storage capacity of the small space. Moreover, metal wine racks can create high-end wine displays regardless of the size of the room. In the left wall upon entering the elegant home wine cellar, Vintage Cellars installed a custom column for magnum bottles. Floor-to-ceiling height frames were used to mount the rest of the wine racks. These achieved an illusion of bottles floating in air. The Vintage View metal wine racks used were in brushed nickel, providing elegance to the wine room. Other advantages of a metal wine storage system include durability, a range of finish options, ability to blend with any theme or décor, and style options. Vintage Cellars offers a broad range of commercial grade cooling systems for Los Angeles home wine cellars. In this project, they installed the CellarPro 1800 XT cooling unit. This compact refrigeration system was mounted on the ceiling, which freed up the floor area, adding a sense of spaciousness to the room. .
A rear duct option was needed to allow the hot air to be ducted out of the room. No modifications were made because a thermostat was built onto the face of the unit. We didn’t want the cooling system to be visible in the wine cellar, so we concealed it using a custom-built metal grill cover. Hiding the mechanical equipment helped maintain the contemporary appeal of the room, which is an important consideration, most especially in glass-enclosed wine cellars. This type of cooling equipment provides quiet operation, adjustable humidity control, and extra large coils for superior efficiency. We offer extended warranty for all our refrigeration systems to make sure that it is regularly maintained. CellarPro is one of the most trusted manufacturers of wine cellar cooling systems. Their products are built with superior efficiency and functional features. Each unit comes with a digital display and an electronic thermostat. These features help make monitoring of temperatures convenient. CellarPro wine cooling units also have a safety feature. They are equipped with audio and visual alarms that warn the owner when the temperature in the wine cellar exceeds the normal range. They also come with the quick-chill mode, auto-defrost cycle, and energy-saver mode. If you have a small space in your home, you can transform it into a modern wine display. Contact Vintage Cellars Los Angeles +1 (800) 876-8789 today. We can create a stunning design to complement your home. Previous PostBasics of a Wine Cellar Cooling Unit Service PlanNext PostWhat are the Types of Insulation Materials for Custom Wine Cellars?